We have been homeschooling since 2005 and have always preferred online resources to workbooks and textbooks. 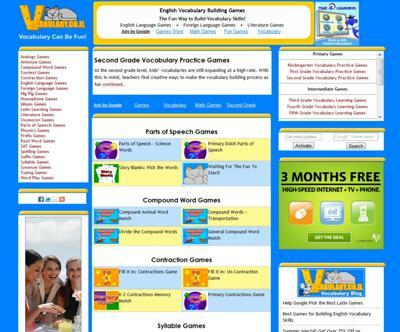 Vocabulary.co.il is an excellent resource for working on vocabulary and one of our most favorite websites! Most kids would rather play a game than do school. This site is one that is the best of the both worlds. They learn, but play and have fun while doing so. Win for us as homeschooling parents; win for them as homeschooling children. The first thing I noticed right away is how easy it is to find what you are looking for. If you want to look for compound word games, they are easy to find. Just as easy to look for are the SAT games, and so forth. Every vocabulary term you can think of, from prefix to homophone to contraction to oxymoron; there are games there for everything. I didn’t know where to start, but fortunately I saw where they had games listed by grade level. I was expecting to see games at the elementary level, and maybe even the middle school level. I was totally shocked to see games at the high school level; all the way up to 12th grade! My boys are in 7th and 2nd grades and they both were able to just jump right in. We found that most of the games had the hint option, which I think is a really good way for them to get a little help, but not necessarily feel discouraged with what they are working on. This site is one that is visited several times a week around here. The best part about all of this is that the site is totally and completely free! You don’t have to sign in or create an account or anything. Just log on and start playing!